I got into the American New Wave scene towards the end of the punk era in Britain. One of my friends got a copy of LEAVE HOME by THE RAMONES and we were all knocked out by it. Up to that point we were all into heavy and progressive rock which meant long tracks/songs, year long stadium tours and mega ticket prices. The Ramones brought the 2.5 minute song back, simple (on the face of it) lyrics and playing in small accessible venues. After The Ramones there was Blondie, The Cars, Talking Heads and Iggy Pop. The latter had been around for some time but the punk/new wave explosion gave him a wider audience. I first heard of him through my liking of David Bowie. I read somewhere that he was one of his major influences so I decided to check him out. My first exposure to Talking Heads was through the album Remain In Light. My usual pattern followed, liked this album so went back through their back catalogue and discovered the earlier albums. One earlier song that did it for me “Psycho Killer”. A classic of the genre if ever there was one. 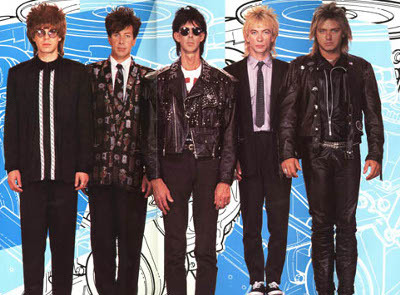 The Cars got my attention through the single “My Best Friends Girl” however it wasn’t until they released Heartbeat Hotel that I really got into them. Now I regard them as one of the best bands of that genre.